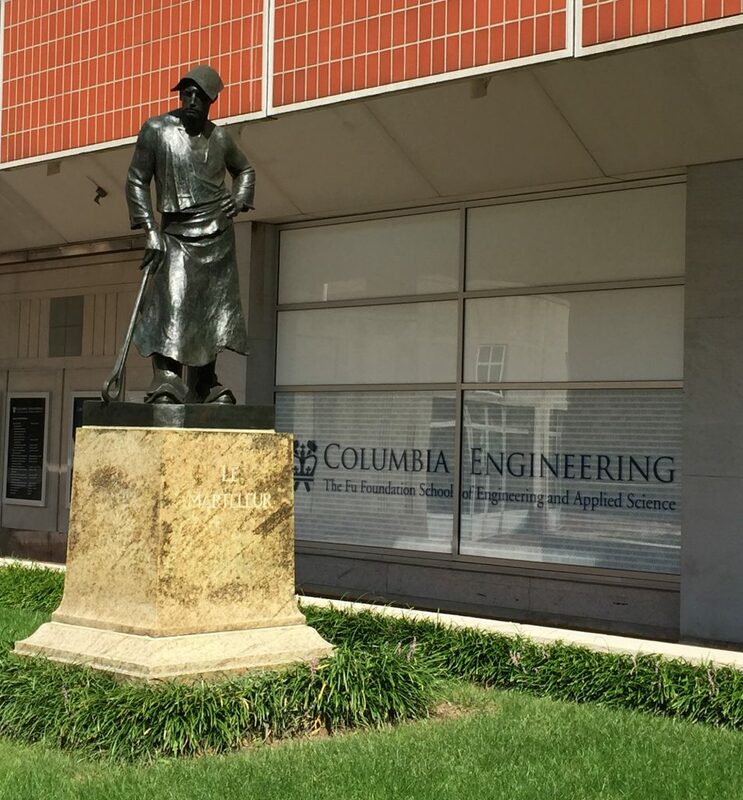 Among the public outdoor sculptures on campus that were recently cleaned, conserved, and rewaxed was the figure you see here, shining in the summer sunlight outside the Engineering building: Le Marteleur (The Hammerman or Hammersmith). This sculpture is by the Belgian artist Constantin Meunier (1831-1905), who became famous in his day for figures that idealized the image of the worker or laborer. The art critic Christian Brinton, soon after the artist’s death, described Meunier’s sculptures as having a “latent idealism [that] animates their every movement. They rejoice in labour well performed. . . . His art is in a sense the deification of work. . . . These men are not building for to-day alone. With each stroke they are strengthening the solidarity of the human race” (pp. 57-59). 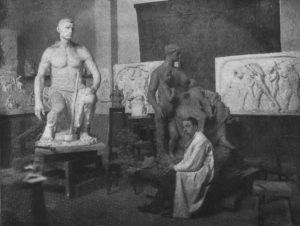 The photograph you see here by M. Duyk shows Meunier in his studio in Brussels surrounded by some of his models and plaster casts (Brinton p. 18). Meunier’s interest in immortalizing the laborer on a grand scale may have been influenced in part by the wave of social-democratic politics in Europe from the 1870s on, as well as renewed interest in the writings of Karl Marx and Friedrich Engels, specifically The Communist Manifesto. Certainly Meunier wasn’t the only sculptor to elevate the image of the worker at this time; comparable examples can be seen in Hamo Thornycroft’s The Mower (1888-90), and in the figure depicting Labor in Jules Dalou’s monumental Triumph of the Republic (1889-99). Although Meunier’s figure wears the clothing and holds the accessories of an industrial metalworker, he stands in classical contrapposto. The idealization of the worker’s body shows this figure is a modernist reinterpretation of the Neoclassical gods and heroes in marble that were popular earlier in the nineteenth century. Le Marteleur was first modeled around 1884. A plaster cast was exhibited at the Salon in Paris in 1886, for which Meunier won an honorable mention. 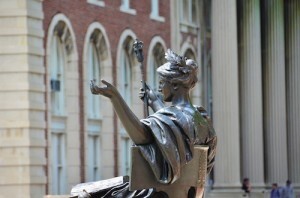 Columbia’s repetition of the sculpture was posthumously cast in bronze by the Fonderie Verbeyst in Brussels. 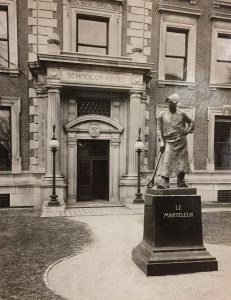 A gift from the Class of 1889 School of Mines, the statue was installed in 1914 outside what was then the new building for the School of Mines, as seen in this archival photograph from University Archives. That building today is Lewisohn Hall. The School of Mines evolved over time (eventually becoming the Fu Foundation School of Engineering and Applied Science), and with the construction of the new building in the northeast corner of the Morningside campus, Le Marteleur eventually was moved along with it and has remained a beacon of the school’s illustrious history for more than a century. Christian Brinton, Constantin Meunier (Buffalo, NY: Albright Art Gallery; New York: Redfield Brothers, 1913), https://clio.columbia.edu/catalog/8489595. This entry was posted in Morningside and tagged AP photos, Constantin Meunier, Le Marteleur, University Archives on August 30, 2018 by Roberto Ferrari.